The Turbine owners organization "Danske Vindkraftværker" was founded in Vrinners, on the Danish liberation evening, on May 4th. of 1978 (The annual celebration of the liberation from 5 years of nazi occupation in World War II.). 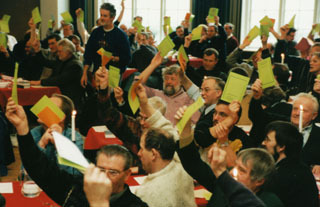 Torny Møller had invited a number of turbine owners, who were, at that time, mostly owners of Riisager turbines. The first board was: Erik Davidsen (Chairman), Karsten Fritzner (vice chairman), Jørn Larsen (treasurer), Lone Kæmpegaard and Jens Gjerding (Tvind). The two main objectives of the organization was: To facilitate serious public information about the practical possibilities of wind power, and to take care of the common interests of the turbine owners. DV supported members with juridical assistance when insurance companies tried to cheat, or when members had a problem with some turbine manufacturer. DV negotiated with the Danish government and electricity boards, when the legal framework for selling electricity to the grid was made, and maintained. DV took over the arrangement of the important regular "VIND TRÆF"'s (meetings), that was started by the Organization for Renewable Energy OVE. DV published a monthly member magazine: "Naturlig Energi", where members could express their view, and read about new developments or legal rules. Especially the monthly statistics of nearly all Danish grid connected turbines, that was published here, was an important part of the magazine. DV created a network between the hundreds of local wind turbine projects throughout the Danish countryside; projects that was cooperatively owned in wind turbine guilds, often in small villages. This created hundreds of local communities, and at a certain time, more than 250.000 Danes owned shares in local wind turbine projects. As the Windsofchange web site is based, mostly on photos, the description of Danske Vindkraftværker is not very comprehensive. To learn more of DV, it is suggested to visit the web site of "Danmarks Vindmølleforening", located in the LINKS part of WOC.